It is a demanding and thought involving process to acquire and design a landscape for corporate offices and malls. It taxes great amount of energy to design and sustain the landscapes and interior with natural plants and trees. This is where the role of artificial plants and landscaping products to mitigate the maintenance costs associated with landscaping becomes important. These live products are fitting options to beautify your office interiors and exterior landscapes. Artificial Areca Palms could enrich your interior with their top notch features and can give a Beautiful makeover to your offices. Areca palms are widely used to brighten the locales of modern offices. The arching fronds of these leafs are feathery and comprise of around hundred leaflets. These plants could easily command the attention of the viewer and add a shade of green to your corporate interiors. But growing these plants in interiors demands extra care and effort. To substitute these efforts, artificial areca palm trees are available in the market. 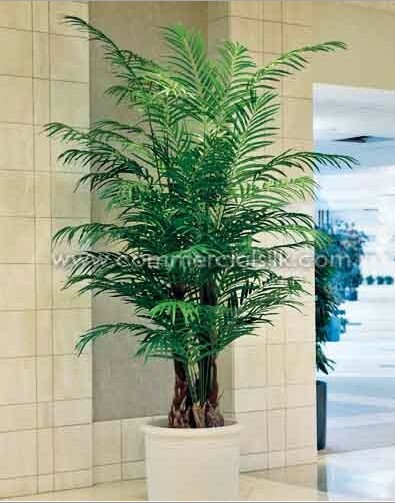 These areca palms help to create a tropical environment in your business space. They are crafted using superior polyester silks, and crafted with extreme care to showcase a life like appearance. It is nearly impossible to detect its faux nature from the crisp and classy appearance. Most natural color tones are used in the design of faux areca palms. They come in dark green, fern green, forest green, light green, jungle green, laurel green, mantis, moss green, myrtle green, mint green and pine green shades. The areca palms are available in different sizes and shapes, as per your choice. While choosing a plant, ensure that the size is ideal for the room or area that is to be decorated. These palms can be nestled in decorative pots, which would also you to quickly and easily shift the arrangement. Compared to the real plants, you don’t have to wait for these readymade plants to grow; you could purchase artificial areca plams in the size you want. Unlike the original areca palms, maintenance costs of these plants are zero. A little carelessness could badly affect the natural plants, while these unreal ones exhibit no such issues. These plants are also long lasting and are designed with great care to match the original. They could decorate your office without sunlight and water. At the end of the day, they do not shed any leaves for your gardeners to clean up. The artificial areca palm trees are beautifully designed and maintenance-free faux plants suitable for beautifying the interiors as well as exteriors of your business spaces, Homes and office rooms. They come in wide variety of selection in size, shape and color in affordable prices.